A fully automated pressure controlling system to generate static atmospheres in connected volumes. Two high-pressure dosing valves in pulsed operation pressurize and depressurize the system. Tuning of the flow conditions is possible using the integrated needle valves, allowing for finest pressure adjustments The system contains a high-pressure sensor with a detection pressure of up to 700 bar in the maximum configuration. A second sensor for high accurate detection in lower pressure regions is optionally available including an automatic shut-off valve for protection. Another option is improved accuracy of pressure detection by using corresponding pressure sensors. 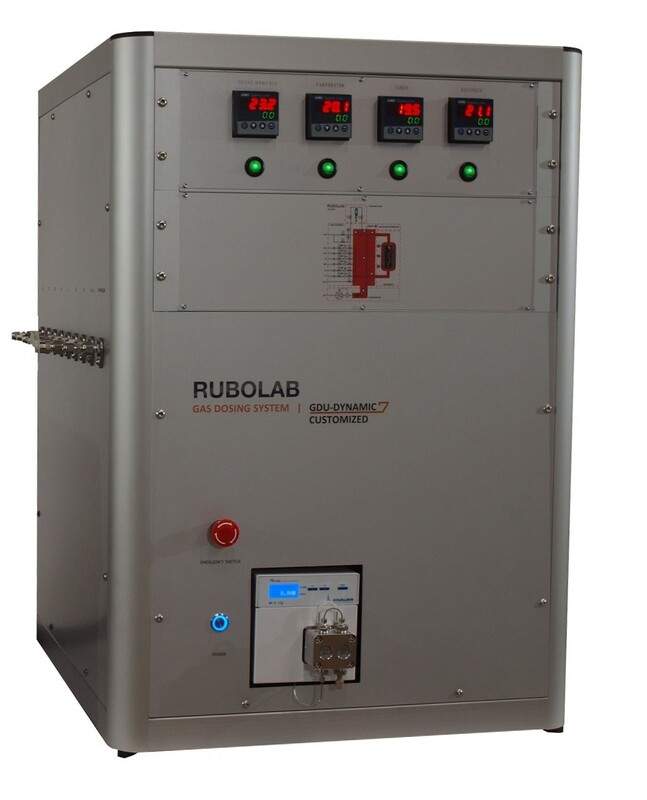 RuboLab gas dosing units of type SC are extensions of our GDU-STATIC-350 and GDU-STATIC-700systems. Valves, pipes and sensors of these systems are heated electrically up to 100 °C, allowing the use of supercritical fluids (e.g. scCO2) and condensable gases. Optionally, we offer fluid pumps to be connected to these systems to compress the gas before pumping it into the preheated pressure regulation unit. The VDU-STATIC systemis designed to dose vapors. 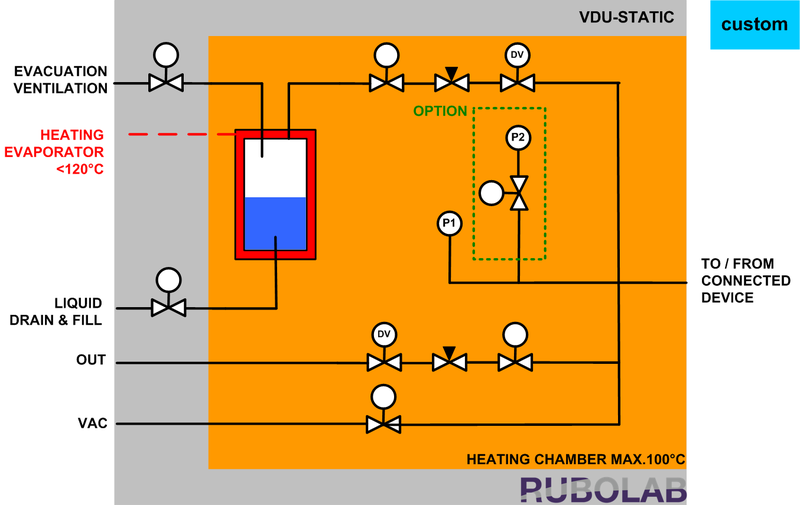 For this purpose,a liquid is evaporated in a heated stainless steel pressure cell, while a liquid thermostat is controlling the temperature.Electromagnetic valves adjust the vapor pressure in the connected device. The maximum detectable pressure is defined by costumers’specifications. 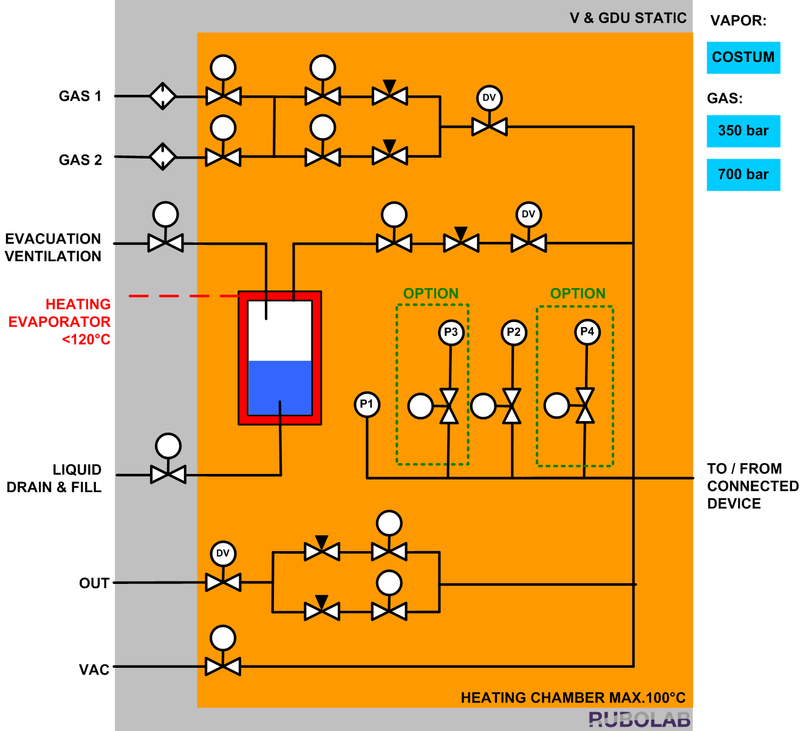 The integration of a second pressure sensor with higher accuracy in low pressure regions is available upon request, as well as a cooling option to generate low vapor pressures of versatile substances. 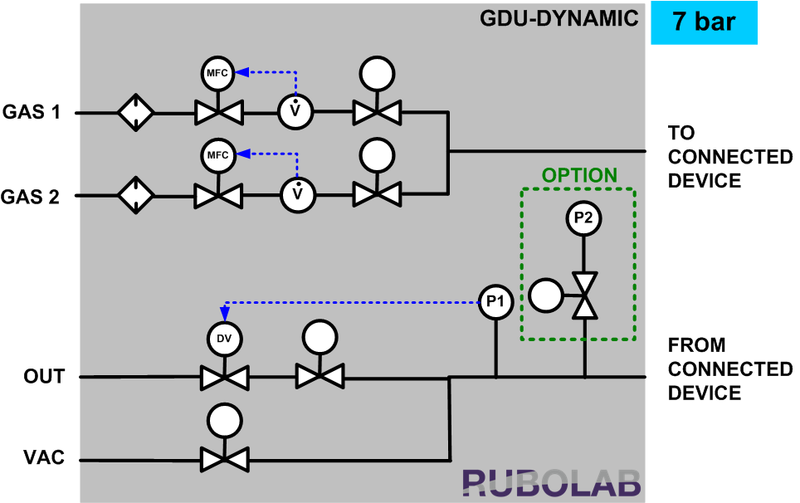 The V&GDU-STATIC combines two dosing units within one single system of compact design: GDUSTATIC-350/700-SC and VDU-STATIC. The system can be operated in gas dosing mode or in vapor dosing mode. Gas pressures in high pressure regions can be detected with sensor P1. An additional gas pressure sensor for lower pressures of less than 40 bar can be integrated optionally (P3). Sensor P2 is used to detect vapor pressures. The maximum working pressure of this sensor will be defined according to the costumers’ specifications. For highly accurate vapor pressure detection in bar resolution, Sensor P4 is available upon request. The sensors P2 to P4 are protected by automatic shut-off valves. 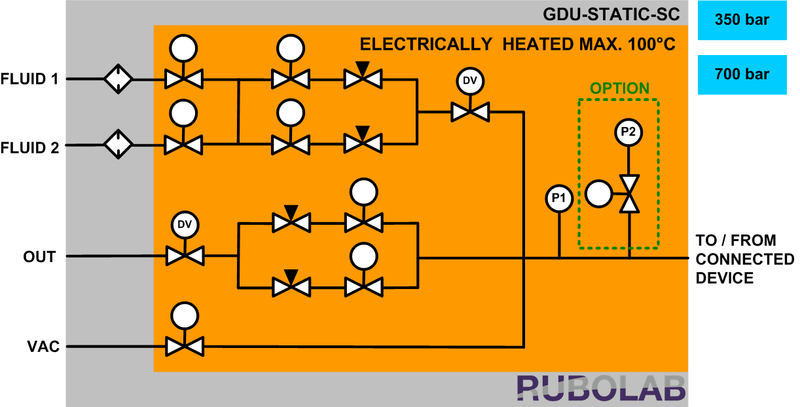 To avoid condensation of evaporated substances the complete system is heated to a temperature of up to 100°C. 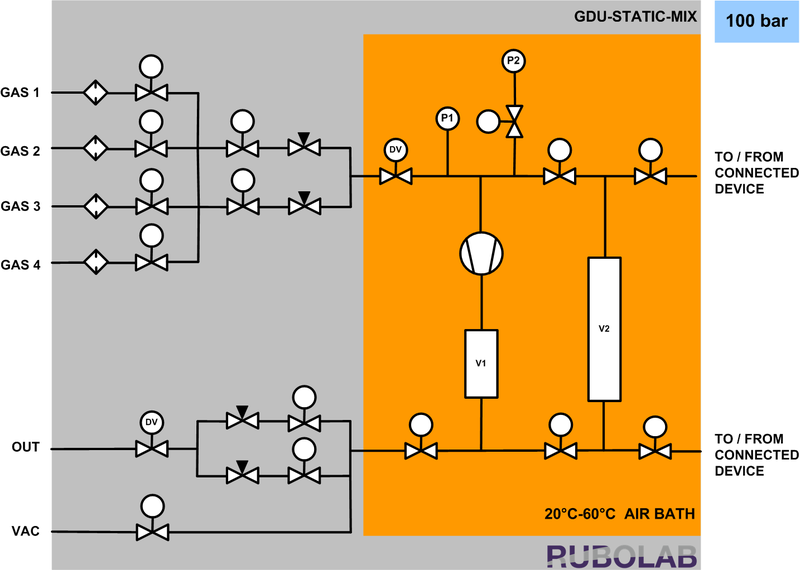 The GDU-STATIC-MIX is designed for the generation of binary gas mixture compositions within a pressure range of up to 100 bar. For this reason, two volumes of calibrated size are placed within a highly accurate temperature controlled air bath. Initially, the volumes are pressurized with pure gases. After connecting the volumes, the gas mixture will be homogenized using an integrated high pressure circulation pump. The base version includes two volumes. The integration of further volumes is optionally available and can be used to generate ternary and quaternary gas mixture compositions. This gas dosing unit controls fluid flow conditions as well as system pressure. It is therefore equipped with two thermal mass flow controllers and a pressure regulation valve. 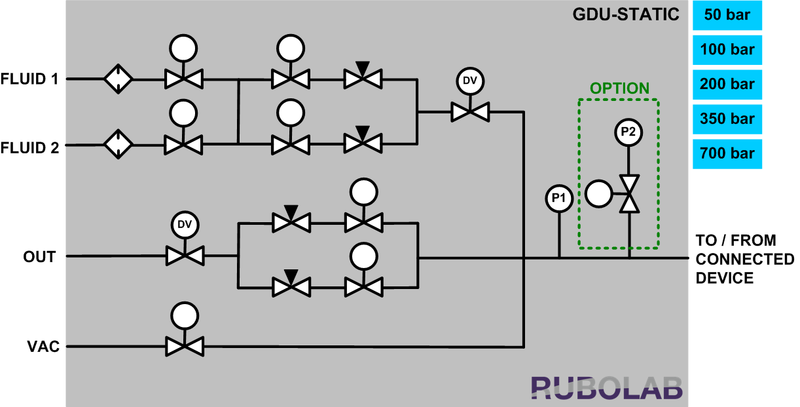 By adjusting corresponding mass flows different binary gas mixture compositions can be generated. The maximum system pressure is 7 bar, detected by a corresponding gas pressure sensor P1. Available options are further gas inlets as well as the use of sensors with improved detection accuracy. 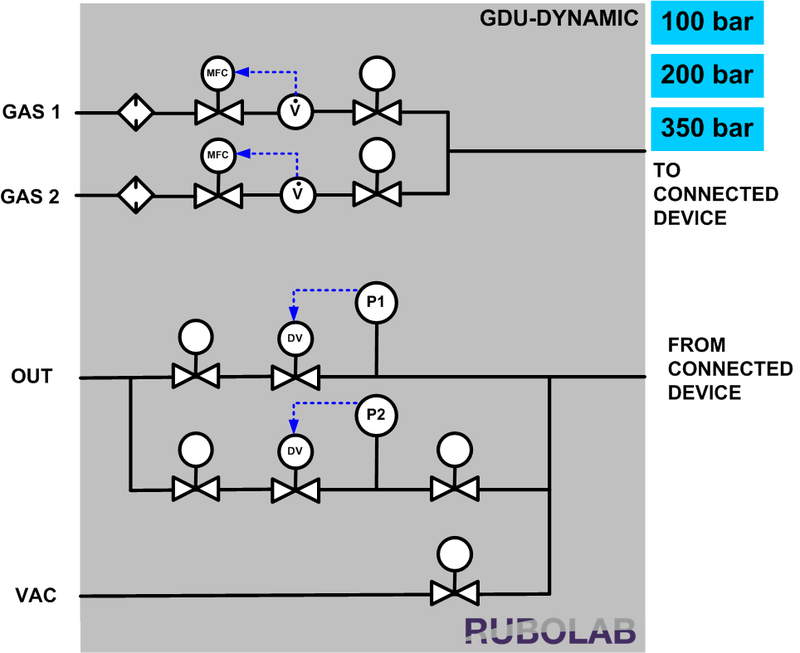 The GDU DYNAMIC gas dosing units are also available in higher pressure versions for of up to 350 bar. To ensure best possible accuracy in pressure controlling, these devices are equipped with two-staged pressure regulation. Thereby, pressures below 40 bar are controlled bya low pressure regulation valve, while a corresponding high pressure valve is used for higher pressures.